IBM Common Data Provider for z Systems collects, filters, and formats IT operational data in near real-time and provides that data to target analytics solutions. IBM Common Data Provider for z Systems enables authorized IT operations teams using a single web-based interface to specify the IT operational data to be gathered and how it needs to be handled. This data is provided to both on- and off-platform analytic solutions, in a consistent, consumable format for analysis. 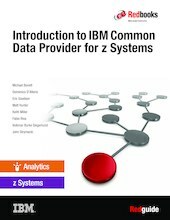 This Redpaper discusses the value of IBM Common Data Provider for z Systems, provides a high-level reference architecture for IBM Common Data Provider for z Systems, and introduces key components of the architecture. It shows how IBM Common Data Provider for z Systems provides operational data to various analytic solutions. The publication provides high-level integration guidance, preferred practices, tips on planning for IBM Common Data Provider for z Systems, and example integration scenarios.